On a cold winter evening in December 1876, Dr. Charles H. Miller stood before the Lykens Harmonic and Literary Association and prepared to speak from his prepared notes. His topic: growing up in Pennsylvania’s Coal Region during the area’s development in the decade before the Civil War. Nine days later, on New Year’s Day 1877, the prosperous community of Lykens, Pennsylvania was brought to its knees by a devastating mine fire. The disaster changed Miller’s life and the lives of thousands of Dauphin County residents forever. While the fire inside the workings of the Lykens Valley Coal Company raged out of control, residents in Lykens and neighboring Wiconisco Township feared for their livelihoods. More than 3,000 people lived in the two communities, and the local economy was built atop the area’s valuable anthracite coal mines. The general impression is among those who understand the topography of these mines that the fire cannot be extinguished; that it must rage until it has exhausted itself for want of fuel. So strong is this conviction among the people of the neighborhood that a panic exists, seizing men in their business transactions, and impelling them to the belief that their local interests have been swallowed up by the effects of the fire which is destroying the mines, as all business there of an individual or general character, merchandizing and manufacturing, is made dependent on the mining interest. The fire in the mines at this season of the year will prove a dire calamity to a large proportion of our citizens, who depended almost entirely upon earnings there for the necessaries of life. And what adds still more to their misfortunes, work, at greatly reduced wages, has been very slack for several months, and but very meager pay could be realized under the most favorable circumstances. The fire occurred at a particularly dismal time for the miners and workers in Wiconisco Township and across the Coal Region. Mired in the fourth year of “the Long Depression,” industry remained slack across the nation. With a depressed economy, orders for anthracite coal remained scarce across the Coal Region. A small number of workers entered the burning mine to assist in efforts to put the fire out, but the vast majority of the 800 miners and workers attached to the mines and related industries in Bear Gap were thrown out of work. The situation looked dire – damage was estimated in excess of $1 million and fierce debate raged over whether the Lykens colliery would ever reopen. As the weather warmed, labor tensions increased to a fever pitch across the country by the beginning of summer in 1877. Pressure continued to build as workers’ pay was slashed and conditions worsened for the miners and laborers of the Coal Region. When collieries began to close due to lack of business, workers felt the blow acutely. Many rushed to join unions and workers’ associations. Others called for violence. This infectious mood spread through the Coal Region and made its way south to Lykens and Wiconisco Township. “Have our manufacturers and operatives forgot that one hundred years ago our hero, George Washington, was fighting to have a free and independent nation?” queried “Workingman” in a letter addressed from Wiconisco on August 6. This letter was published by the Harrisburg Independent in August 1877. But what caused the colonies to war with England, was it a plot to destroy their former mode of Government? Nay, it was for the protection of their own and our own industries and from being suppressed to starvation with taxes on tea, etc. This revolutionary fervor raged across the nation throughout the summer, and the fires of revolt were further fanned when railroad workers in Martinsburg, West Virginia walked off the job and began blocking rail traffic on one of the busiest railines in America. Thousands of railroad workers followed suit and violence scourged the nation’s industrial corridors. In the Coal Region, riots broke out in Shamokin in what became known as the “Shamokin Uprising.” Two people were killed and more than a dozen wounded when a sheriff’s posse opened fire into a crowd there on July 25. Headline in the Harrisburg Independent, July 26, 1877. Beneath this nightmarish landscape of mob violence based on labor strife lay an undercurrent of ethnic tensions in the Coal Region as well. For years, attacks on collieries and colliery management by the so-called “Molly Maguires” heightened tensions across the mountains and valleys of eastern Pennsylvania. In a landmark trial in 1876, a series of alleged Molly Maguires were convicted of murder and sentenced to death in Pottsville and Mauch Chunk. 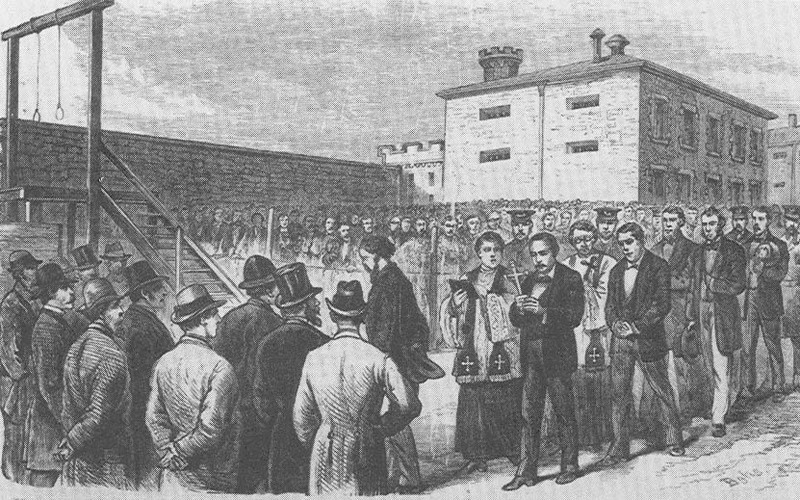 On June 21, 1877, ten Irishmen plunged to their deaths from the gallows in a series of executions that remain controversial into the 21st century. Against this backdrop of chaos and bloodshed across the United States, the people of Lykens Borough and Wiconisco Township suffered. The same reporter acknowledged that rural areas to the west of Wiconisco Township were overwhelmed by hungry residents traveling from the industrial areas. “The farmers in Lykens Valley are greatly imposed upon by beggars,” he wrote. A meeting, called sometime since by the borough authorities, to devise means for the relief of the poor of our town, disclosed the startling fact that over 100 families in this small community were at the time destitute both of employment and the means of procuring the necessaries of life. This is a most gloomy outlook for the coming winter, and should business fail to revive much suffering will ensue. Many express a hope that our Government will take some action that will relieve the general stringency and bring back prosperity. Whether this hope is well founded time will show. The colliery’s superintendent, E.C. Hanna, opened up the culm banks on the northern and western edge of the community for the community to pick through. This provided heating and a potential source of income for those in Lykens and Wiconisco in order to assist them through the autumn and into the winter months. Others turned to crime. The newspapers are full of petty theft, pick-pocketing, and other minor criminal activity. Farmers again lamented the “sharpers” who appeared from the coal regions and did not leave until they received food and other supplies. “Small thieving has been practiced hereabouts to some extent recently, the articles stolen consisting principally of food,” wrote another Lykens correspondent for a Harrisburg press. These scenes of hunger and poverty were little abated by promising news from the workings of the Lykens Valley mines. By November, the water that had been poured down the slopes into the mountain to put out the inferno had been pumped out of the workings. A celebration was held in Lykens to commemorate the potential return of business, investment, and prosperity to their stricken community. Yet, it was April 1878 before the first shipment of anthracite coal made its way from the workings in Wiconisco Township. The community began to rebuild in the wake of a desolate 15 months with little business. Economic conditions began to improve around the nation following a desperate summer of labor strife, violence, and bloodshed. Trained as a doctor at the University of Pennsylvania, Charles H. Miller turned to writing while his family’s money helped support him. This is how he came to be speaking in front of the Lykens Harmonic and Literary Association on December 22, 1876. Following the mine fire and subsequent economic collapse in Lykens, Dr. Miller headed west toward Kansas. Unable to make a living in the West, he made his way back toward his hometown at Lykens. A friend in Lykens received a letter in early 1889 from Dr. Miller, saying “he would starve in the West and would try to work his way East.” That journey ended in Pittsburgh, Pennsylvania in early June when a railroad worker found Dr. Charles H. Miller lying unconscious with significant blunt force trauma to the skull. He died several days later. Dr. Miller’s sad story perfectly represents the fate that befell many residents in the northern end of Dauphin County in the wake of the Lykens Mine Fire of 1877. The fire took place against a backdrop of momentous national events that both influenced and impacted events in Lykens and Wiconisco Township. By examining the experiences of the working class through such a disastrous event, a clearer picture of why radical ideas reigned and violence broke out in so many American communities in one of our America’s most chaotic years.